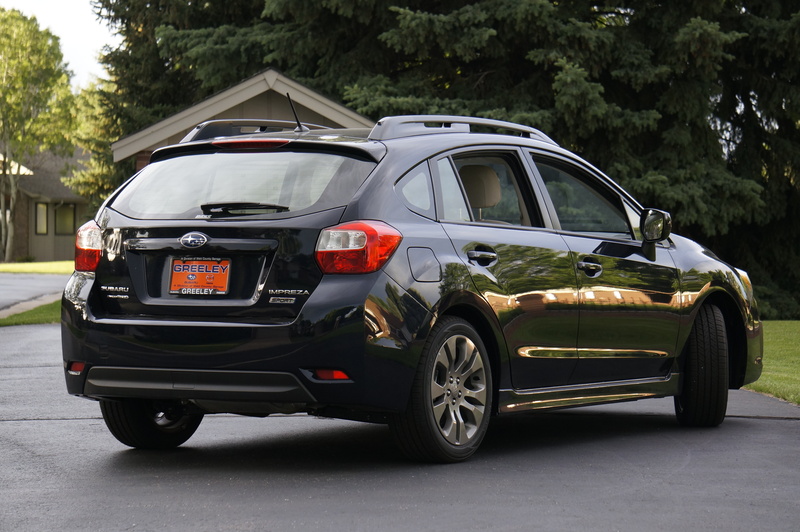 The 2014 Subaru Impreza Sport 2.0i Sport Premium is the topic of this week’s review. I recently got to test out a Deep Sea blue pearl 5-door hatchback model with ivory cloth buckets and a “boxer” four cylinder power plant. It was supplied by Greeley Subaru. The punch-counterpunch action of the boxer pistons in the Subaru cancel each other out and provide a smooth delivery of power. Also, the low profile, horizontally opposed engine results in a lower center of gravity in the vehicle, aiding the handling and cornering characteristics. Porsche and Subaru are pretty much it when it comes to boxer automobile engines, and the design is found in some BMW and Honda motorcycles. It is a design patented by Germany’s Karl Benz in 1896. The little Impreza was pretty good looking and some of the things I liked included all the windows to look out of (five down each side of the car), the attractive striped cloth upholstery, the solid feel, and the functional hatchback arrangement. Horsepower is 148 @ 6,200 rpm with resultant torque of 145 lb. ft. Fuel economy ratings are 27/city and 36/highway, 30 miles per gallon combined. The transmission is a continuously variable (CVT) Lineartronic automatic transmission with paddle shifters on this model, and of course the car sports a “symmetrical all-wheel drive” configuration. This Subaru is the most fuel-efficient all-wheel drive car in America. Wheelbase is 104.1” and length/width/height is 173.8”, 68.5”, and 59.5”. Weight of this automatic transmission model comes in at 2,998 lbs. I mentioned the striped ivory buckets earlier, but did not mention the heated feature. Inside, the Sport also has 60/40 flat folding rear seat, cruise control, Bluetooth hands-free setup, steering wheel audio controls, tilt/telescope, center console with lots of storage and an emergency brake handle, hands-free phone connectivity, 6-speaker stereo, keyless entry, and antitheft security system. The materials in the Subaru are nice, the ride is suitable, and noise is at a minimum. These Subarus are designed for brainy people that live in a cold climate. Like residents of Colorado. My wife and I took a ride to Loveland in the 2.0i, and I think the people on U.S. 34 were enjoying the view of our car. It has kind of a dark gray set of 17”, ten-spoke alloy wheels fitted with 205/50 R17 Yokohama Avid S34 all-season radials and the Deep Sea blue pearl paint is a great color. Big six-star blue emblems are fitted on the front and the rear, and some husky looking roof rails are installed on top. Total M.S.R.P. 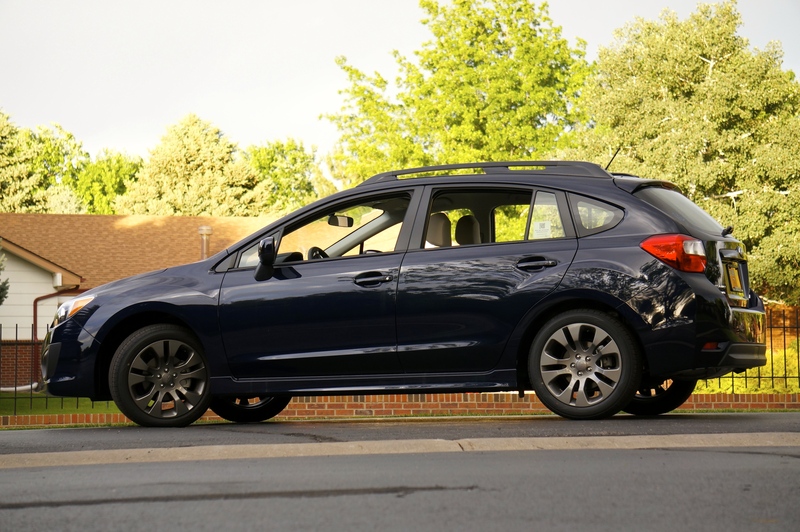 of the Impreza was $22,734.00, including a base price of $20,795.00, freight ($795.00), all weather floor mats ($72.00), cargo tray ($72.00), and the automatic transmission ($1,000.00). I think it is pretty reasonable price and this five-door Subaru represents a prudent purchase.